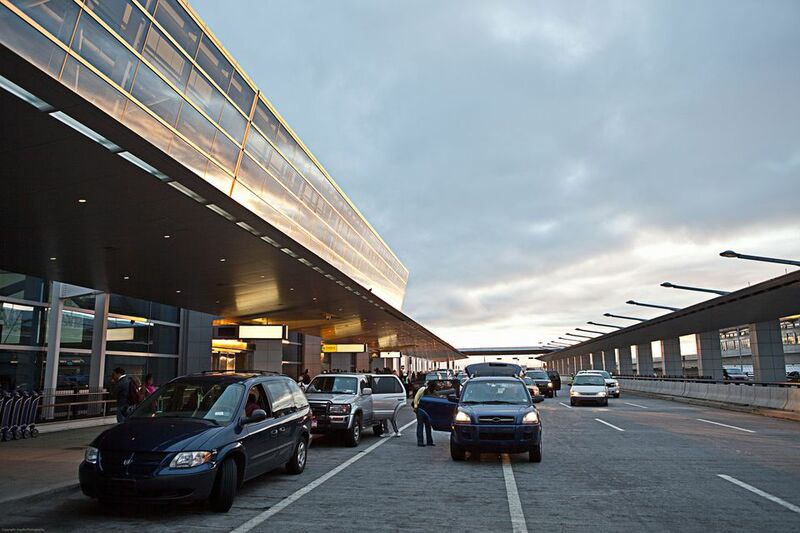 This guide provides information about airport parking at each of the ​Washington, DC area airports including economy options and discounts. The Hourly and Daily garages at National Airport have been combined into one facility named Terminal Parking. Courtesy shuttle buses are available from the parking lots to the terminals, although the garages are within walking distance of the terminals. Parking spaces are limited at Reagan National Airport. During peak travel times, parking lots may be full. Passengers are advised to call (703) 417-PARK, or (703) 417-7275 before driving to the airport. Parking Discounts: Airport Parking Reservations.com offers guaranteed reservations are available for parking at a discounted price. Short Term Parking Lot: A new 99-space surface Short Term Parking parking lot has been added between the garages and the Terminal building. Pay for Parking with Your Smartphone: You can now make parking payments via a smartphone app. Terminal and Economy parking entrance and exit gates displaying a QR code accept payment through the QuickPay app, which is available for free download to most smartphones. Customers with registered accounts can scan the QR sign from their vehicle at the entrance and exit gate for paperless billing. Rates are the same as for other customers. Guaranteed Parking in Advance: 703-417-PARK (7275) - Parking spaces are limited at National Airport, so this is especially advantageous during peak travel times. Use ePark to guarantee in advance that a parking spot will be available when you get to the airport—from 24 hours to six months before your trip. Customers can secure their parking reservation with a credit card online. Reservations can be changed or canceled online up to 24 hours before arrival time, free of charge. Cell Phone Waiting Area: There is a designated area available for drivers to wait in the vehicle for arriving passengers (limited to one hour). It is located near the end of the “Return to Airport” ramp just beyond Terminal B/C. Pay-and-Go: An automated payment system with payment machines located in the lower level of the terminal near the east and west exit doors and on the pedestrian bridge near the Daily Parking Garage. Cell Phone Waiting Area: Located at the intersection of Rudder Road and Autopilot Drive. Pay-and-Go: Machines in the Skywalk connecting the Hourly Garage to the terminal allow travelers to pre-pay airport parking fees before exiting the hourly garage through an automated toll lane. Pay-and-Go machines are also located in the Concourse A, B and D Skywalks. Cell Phone Waiting Area: Located across from BWI Marshall's Daily Garage at Terminal Road and Scott Drive (one block off of MD 170). Where to Park Near the National Mall in Washington, D.C.